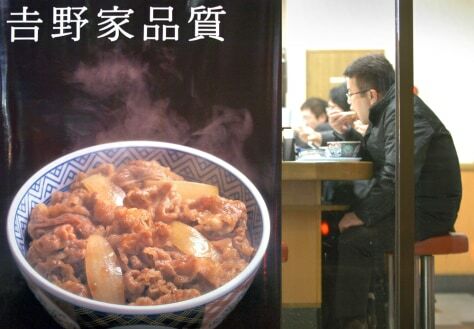 Diners eat at the counter of Yoshinoya, a fast-food restaurant that serves "gyu-don" -- bowls of sliced beef over a bed of white rice-- in Tokyo. Yoshinoya insisted that the meat they offer is tested safe, although the restaurant chain uses mostly American beef. The poster reads: "Quality by Yoshinoya."